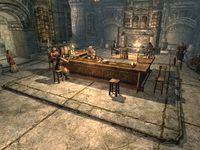 Silver-Blood Inn is an inn located in the city of Markarth. The inn is owned by Markarth's prominent Silver-Blood clan, even though the members of the family are never seen in the building. They leave the business of running the inn to Kleppr, who rents rooms and sells food and drink. His wife, Frabbi, works at the inn, at least when she is not busy arguing with her husband. If Kleppr dies she takes over running the business, with nearly as many complaints about her husband as when he was alive. Their two children, Hreinn and Hroki, are also kept busy with jobs around the inn. * This person only sells raw meat during normal opening hours at his stall, outside in the maket area. ** This person never spends any time at the inn. 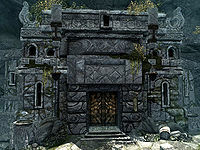 The Silver-Blood Inn is one of the largest inns in Skyrim, and many other townspeople can frequently be found at the inn. Entry is directly into the common room with a central bar facing you and a fireplace behind against the southwest wall. There are two corridors off this room one to the southeast and one to the northwest, with two flights of stairs up to closed doors also one to each side. Kleppr, the innkeeper, is always standing behind the counter ready to welcome all-comers. There are many food sacks around the establishment and all the beds and tables are made of stone. In the northern and eastern corners are sets of shelves, the first holds a gourd and the second just clutter. To the right of the eastern shelves is a shelf with five potatoes and a cast iron pot containing a potato and cabbage, with a barrel containing ingredients to the right and having two pieces of cheese on top. A matching ledge opposite to the north holds a bottle of alto wine, a bottle of wine, with an unusable barrel beside it with a woodcutter's axe on top. The counter is a square U-shape, facing the entrance. On the counter there is a bottle of Nord mead, a goat cheese wedge and a loaf of bread, with six wooden bar stools arranged in twos on each side. Under the counter are two small coin purses, a loaf of bread and a key to Margret's room, that is useful during The Forsworn Conspiracy quest, however you can gain it purely by asking Kleppr. Between the corridor and stairs to the southeast is a small set of shelves with a leather strip and a wooden bowl containing two blue and a purple mountain flower on top. To the left of the fireplace against the southwest wall is a basket containing a cabbage and leek. There is nothing of interest on the right side of the fireplace. Nor is there anything of interest on a set of shelves between the corridor and stairs to the northwest. The corridor to the southeast has a door a few paces along on the left, which is the room you can rent. It enters into a bedroom with a single owned bed against the northeast wall, with a table to the southeast. There is only clutter in this room. Further along this corridor is a flight of stairs leading up to Margret's room, if you managed to save her during the relevant quest she will either be in here eating or in the common room sat by the fireplace. The room has a single owned bed against the southeast wall, with a wall shelf above holding a copy of Nightingales: Fact or Fiction? and a bunch of lavender. To the northeast is a table and chair with a bottle of wine, a baked potato, a salmon steak, a red and green apple and a goat cheese wedge on top with a plate and goblet. At the other end of the room is a shelf with a few loaves of bread and three apples on top of it. In front of the shelf is an end table with a plate holding a silver necklace, a medium coin purse and three loose septims all on top. The end table also contains Margret's Journal (see notes). The closed door to the southeast opens directly into Kleppr and Frabbi's quarters. They consist of a double owned bed against the northeast wall with an end table on either side of the bed. 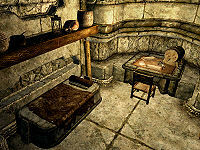 Between the end table and bed on the left, is a shelf with an iron dagger and small coin purse on it. The end table to the right has a bottle of wine on top. To the right is a shelf on the southeast wall with an apprentice strongbox next to a dresser with a business ledger, a medium coin purse and a wooden bowl containing a bunch of juniper berries on top. Above the dresser is a shelf with a barrel containing ingredients, while to the right is a rack hanging from the ceiling holding a rabbit, a pheasant and a bunch of elves ear. In the southern corner of the room is a fireplace with a cooking pot and pot hanging in front of it. The pot contains a raw rabbit leg and portion of grilled leeks. To the right of the fireplace is a tall wardrobe containing clothes, with a table and two chairs to the right. On the table is a bottle of alto wine, a bottle of wine, a salmon steak, a seared slaughterfish, a portion of grilled leeks, a tomato, two loaves of bread and an eidar cheese wedge. The door to the northwest opens into a twin bedroom with two single owned beds. They are both facing the same way, against the northeast wall with an end table between them with a bunch of tundra cotton and two loose septims on top. By the first bed, on the northeast wall is a shelf is a small coin purse and copy of The Legend of Red Eagle, which if you haven't already started the quest reading it will cause the quest to start. Above the head of the bed, on a shelf is a bottle of alto wine and a loaf of bread. The shelf by the second bed has a loaf of bread on it. The shelf on the northwest wall, by the foot of the second bed has on it a couple of apples and a bunch of lavender in a cast iron pot. To the left of this is a tall wardrobe. There is a fireplace in the western corner with a cooking pot on a stand in front and a rack hanging from the ceiling to the right, holding a bunch of dried elves ear and a bunch of dried frost mirriam, with a seared slaughterfish on a block of wood beneath it. To the left of the fireplace is a pile of firewood with a shelf above it holding a copy of Herbane's Bestiary: Hagravens and to the left of the firewood is a barrel containing ingredients with a loaf of bread and goat cheese wheel on top. In the southern corner is a table and two chairs, with a bottle of wine, a baked potato, a red apple, a loaf of bread and a goat cheese wedge on top. The corridor to the northwest has a door on the right similar to the one you rent, with an owned single bed against the southeast wall, with a pair of hide boots and a steel sword on the floor above the head of the bed and a loaf of bread on a shelf beside them. Above the bed is another wall shelf holding a bottle of alto wine and a basket containing a few loose iron arrows. Against the northwest wall is a table with a bottle of alto wine, a potato, a couple of pieces of eidar cheese and a basket containing two gourd on top. To the left of the table on a shelf is a small coin purse. Like the other corridor past this room there are stairs leading up to another bedroom, used by Hogni Red-Arm when he isn't working, selling raw meat from his stall on the market. It has a single owned bed against the northwest wall, with a shelf above holding a bottle of wine and a bucket containing three potatoes by the foot of the bed. On the shelf to the southwest is an iron war axe, a Dwemer Pan, two bottles of alto wine, a pair of cabbages, a red apple and a leather strip. Against the northeast wall is a table and chair, with an iron dagger, a bottle of wine, a joint of raw beef and a tomato on top. There are several people who spend either all or a significant amount of their time at the inn. Ogmund is the local bard and spends most of his time here, although he sleeps at his own house. Cosnach, Degaine, and Muiri are some of the regulars at the bar in the evening, but they do not live in the inn. There is a Danger shadowmark to the top right of the entrance door. Editor ids suggest that this inn was originally named the Silver-Fish Inn, and that the Silver-Blood clan also originally had that name. If Margret dies at the start of the relevant quest picking up her journal will cause it to become stuck as a quest item permanently.--(see the relevant quest for more details).